This will show you how to use a single installation of WordPress for multiple sites. This is not to be confused with WordPress’s multisite and is an excellent way to handle a single WordPress location to run multiple domains off of. I have been using this for local development for over 7 years and I have multiple corporate WordPress websites running off this same setup. For this to work as expected, there are a few things that need to be understood. I have even used this in Windows without an issue. To make symlinks easier in Windows, you could install the Link Shell Extension. You will still have your own wp-content outside of the subdirectory but I will discuss that towards the end. I will discuss this more because the official page on this over complicates the process. This requires a global wp-config.php that I will provide. Each site has constants that need to be added to their own wp-config.php to ensure site separation of content. This requires that you have all sites installed in a single directory (e.g. home) and each site’s directory is the ServerName in the virtualhost. Create a directory named wordpressVersions in the same directory you install the sites. This is where all WordPress version will be installed. * This config is required due to the way WordPress loads the config file. * WordPress will check outside the WordPress directory to load a config. * The defaults in this config works for most installs. * If you have WordPress in sub-folders of web root, you will need to override a constant to point to the correct directory. * The location from the web root, no leading or trailing slash. * This is the global to disable file edits on the site. It should be noted that GLOBAL_WP_DEFAULT_WP_CONTENT_URL is using HTTPS protocol, you can adjust this as you see fit. This can easily be overriden by the site’s index.php file. I will explain this towards the end. Also note that I disable auto updates for core and plugins. I use this on PRODuction so this shows you how I can globally disable these across all sites. If you don’t like that, go ahead and remove them. You only need to keep any that start with GLOBAL_WP_DEFAULT_. You can use the default WordPress config as normal for your site setup. The only difference is that you must define some constants for WordPress to work properly. Ideally, you can use the constants from the global wp-config.php. You can also add any other constants here that you want to be globally accessible between all sites. This is all there is to setup the global directory of WordPress versions. Now let’s setup a site to use it. For this, I will use www.domain.com for my example. WordPress let’s you change the location of the wp-content directory, including plugins and themes. For this example, we are not going to fully customize these locations but instead keep the structure we all know. Keeping everything inside the wp-content directory. The official site messes up the subdirectory installation. All you need to do is use the default index.php that comes with WordPress and add the subfolder to it. No need to modify anything else. Seriously… not sure why the official site misses this one simple method to install in a subdirectory. This is what the index.php should be, assuming you used wordpress for the WordPress subdirectory. wp-config.php – Make sure to add the edits below for this to work. This is not to be confused with the wp-content that is inside the WordPress version directory. For beginners, you can just copy the contents of the WordPress wp-content but the point here is that your code should be isolated from WordPress in the first place. Ideally, you would create the wp-content directory with it’s subfolders plugins and themes. Make sure to keep the index.php here as it’s just a security measure if you have directory listing enabled. Install your plugins and themes into these directories respectively. 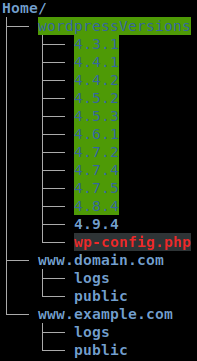 Next, let’s configure your wp-config.php so you can use the global version of WordPress. For novices, put this under your database constants. Again, note the HTTPS protocol in the constants. Change if you are not using the HTTPS protocol. This is the real power behind this setup. For every site you have that needs wordpress, you just have to add a symlink. When you update WordPresss, it’s as easy as deleting then adding the symlink for the new version. There are numerous different ways you can use this setup. For me, this has been the most beneficial and it allows me to rollback very easily if an upgrade goes wrong. If all goes well, your site is now up and running. Go ahead and try with another site to see the true power behind this setup.